I am working on a project that faced the situation which I need to raise the same event to more than one HandleExternalEventActivity activities working in parallel, and I wanted just one of the HandleExternalEventActivity's to handle the coming event according to an identifier that I'm going to send with the EventArgs. The problem comes, that by default, if you have a ParallelActivity and inside each branch you have a HandleExternalEventActivity activity, when you raise the event from the host, you can't control which HandleExternalEventActivity gets the event, so the most left HandleExternalEventActivity gets and handles the event before the other even if I wasn't targeting it in the first place. after some searching and reading some working or sometimes old & not-working samples, I found out something called Correlation. so as I could understand, Correlation is how you specify a parameter in the ExternalDataExchange that is going to identify who is going to handle the Event, and only the HandleExternalEventActivity that has the same parameter in its CorrelationToken will handle the event. so it first sounds like a big blah blah blah blah. but after some trials I managed to write some steps of how you do that. CorrelationInitializer: this is where you are going to specify the correlation parameter value, the CorrelationParameter should be a parameter to this method, and take care to write it exactly as you wrote it in the CorrelationParameter attribute with the same casing. CorrelationAlias: this is where you specify the location of the parameter in the event arguments, because as we said before, the event argument will hold the destination identifier. args.Id = identifier; // setting the specified identifier to the Id property in the TaskEventArgs. 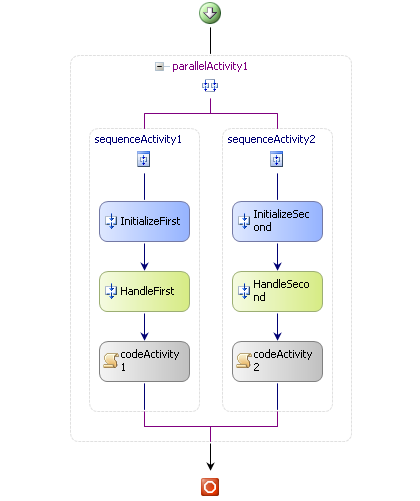 4- Now go to your Workflow designer, and add in every Parallel branch a CallExternalMethodActivity before the HandleExternalEventActivity you already have. as you can see in every branch you have a CallExternalMethodActivity, and HandelExternalEventActivity. forget about the other two code activities right now. 5.2 set the Method Name to the method that has the CorrelationInitializer attribute, in our case the Initialized Method in IService. 5.3 now you will notice that you have another option in the properties of the CallExternalMethodActivities called CorrelationToken, write a name inside this box "C1" for example and then expand the node by clicking on the + sign beside the CorrelationToken text and set the OwnerActivityName property with the name of Activity that holds the CallExternalMethodActivity, in our case it is sequenceActivity1. 5.4 also you will find the parameter of the Method you are calling shown in the property grid, in our case it is Identifier, set it to the identifier value you want, or bind it to a member of property, in our case we will bind it to the string "First"
6.4 Repeat this settings for all other HandleExternalEventActivities you have, in our case HandleSecond but use the C2 CorrelationToken for this one. also for a complete example, I attached the complete version of the last code with this blog post. with enough documentation in the code. If we want to Event Handling a third CallExternalMethod after the Parallel Activity.